"[Gov. Jeb Bush] has put Terri through a week of hell and our family through a week of hell by not acting," said Bob Schindler, father of Terri Schiavo. After everything that Jeb Bush has done it seems quite remarkable to hear him now being attacked by Terri Schiavo's parents as this tragic tale finally winds to an end. But I can understand the Schindlers in some ways. Everybody knows that they have been through a terrible ordeal and have not come to grips with the idea of losing their daughter even after 15 years in a vegatative state. But they have also been on quite a heady power trip these past few weeks with round-the-clock media attention and just about every politician and courtroom in the country ready to jump every time they call. The average person is unlikely to ever get a legal case before the Supreme Court and those that do must usually wait months if not years for any action. But the Schindlers can file a legal action and have the highest court in the land give it immediate attention every time. So it is no wonder that they would feel like they can be justified in berating the governor of Florida for not jumping through the latest hoop in this circus that is being orchestrated by the religious right fundamentalists. Fortunately, Jeb Bush must still value his political future because he is unlikely to heed the religious fundamentalists and call out the National Guard to forcibly take control of Terri Schiavo in contravention to every court in the land. In my previous post, I defended Michael Schiavo, Terri's husband, as having been unfairly maligned during this whole ordeal. I think the record is clear that he did everthing that was reasonably possible and then some to try and rehabilitate Terri to some semblance of conciousness. Nevertheless, I think he is wrong now and should have conceded to let Terri's parents take over guardianship at this point. I understand that Michael thinks he is doing what Terri would have wanted by ending the artificial life support that is keeping her alive at this point. But I would point out that it no longer matters to Terri. I don't believe she has any awareness in a physical sense of what is going on and therefore it does not matter to her whether the feeding tube stays in or out. But it does matter to her parents, and since they refuse to accept that she is gone they are the only ones who are suffering by having the feeding tube removed. Terri was never going to be able to fulfill her dreams of being a wife and mother, but what is left of her was serving at least one good purpose by giving her parents a focal point to their lives. That is why it was wrong for Michael to end life support - not because it is hurting Terri - but because it is hurting the Schindlers. Interesting article in the WSJ today (page A4) about who is paying for all the medical treatment and care that Terri Schiavo has been receiving. Earlier I had mistakenly assumed that all of her care was being handled privately by the family. But according to this article the hospice where Terri currently resides has footed the bill for the past two years on a pro bono basis while Medicaid has picked up the tab for her prescription medications. I don’t have a problem with Mrs. Schiavo going on the government dole, but I question the sincerity of some of these Republican politicians who are demanding that her medical treatment continue indefinitely while at the same time voting to slash $18 billion from Medicaid. That’s the Republican “Culture of Life” for you - lots of lip service about the sactity of life up until the point where it starts to affect their wallets. While driving home the other day I had the opportunity to listen to the newest San Antonio talk radio station KAHL AM1310 which was airing Carl Wiglesworth’s show. I became intrigued as I listened to Wiglesworth read from a 40-page report on the Terri Schiavo case prepared for Florida Gov. Jeb Bush by Dr. Jay Wolfson, a professor of public health and law at the University of South Florida, who was appointed by the Florida courts in 2003 to be Terri Schiavo's guardian ad litem. Here is the 40-page report which provides exhaustive details of the history and background of this case. What struck me is how much of the crap that is being spewed on other talk radio stations, cable TV news programs and across the blogosphere is flatly contradicted by the facts in this case. For instance, I’ve heard countless times that Michael Schiavo refused to provide any rehab care for Terri when in fact he spent the first four or five years after her collapse providing her with the best possible treatment. Even if you disagree with Michael Schiavo’s decision to have Terri’s feeding tube removed over the objections of her parents, you can’t read this report and not come to the conclusion that he is being unfairly maligned and defamed in this matter. Today we have people making outrageous allegations against Mr. Schiavo that ignore reams of medical documents in the case. They claim that Terri’s collapse was not the result of a potassium deficiency brought on by her extreme and rapid weight loss and her eating disorder, but instead was due to Mr. Schiavo’s attempt to murder her by strangulation. You would think our State Department would have better things to do than persecute a former chess icon for a 13-year-old sanctions violation. Chess legend Bobby Fisher has finally been freed from a detention cell in Japan where he was being held since last July at the request of the Bush administration. In Washington on Tuesday, the State Department said it had officially asked Japan to hand over Fischer because of the charges against him. "That's what we've asked for," said Adam Ereli, deputy spokesman for the State Department. "Mr. Fischer is a fugitive from justice. There is a federal warrant for his arrest." Good grief! They can't capture Osama bin Laden but by golly they rounded up that dangerous fugitive Bobby Fisher! Woohoo! Now that Iceland has foiled Bush's attempt to bring Fisher to justice what will he do next? Launch a military invasion? One of my favorite Hollywood liberals is Paul Newman, who doesn’t even live in Hollywood. Married to the same woman (Joanne Woodward) for 47 years and founder of a non-profit corporation that raises millions for charity, Newman is the opposite of nearly every Hollywood stereotype and caricature that the right likes to harp about. Now 80, Newman recently said he is thinking about retiring. I certainly hope not. Especially since he adds that there is still a chance that he and Robert Redford could reunite on a future film project. When I was working in Connecticut in the early ‘90s I had several opportunities to write about charitable donations by Newman’s Own which is also based there. One was to the National Theatre of the Deaf which is a troup of deaf actors who travel around performing wordless plays and skits for deaf children. I’ve tried to make a point of purchasing Newman’s Own products ever since. I said earlier that I think Terri Schiavo’s parents should have some legal standing in deciding her fate and I stand by that opinion. However, I also believe that the mountains of legal and medical documentation that has been exhausted on Schiavo’s case make it clear that she no longer has the brain capacity to recover to any state that we would recognize as being conscious. As this article makes clear, the longest time that anyone had ever been in a vegatative state and then came out of it was 20 months (and even then they were left paralyzed and unable to speak). Schiavo has been in a vegatative state for 15 years. People have recovered from comas after longer periods of time, but a coma is not the same as a vegatative state. Terri Schiavo currently has the mental capacity of a house plant. The only people who claim that she can ever recover at this point are quacks. Still, I think that the courts should allow Terri’s parents to continue to care for her as long as they so choose. I understand Michael Schiavo’s belief that his wife would not have wanted to go on in this state. But at this point I don’t think Terri cares one way or the other. What is most disgusting in this situation is the way the Republicans have turned it into a media circus in an effort to pander to the religious fundamentalists. Kevin Drum notes that President Bush finally found an issue serious enough for him to interrupt one of his Crawford ranch vacations. And where is the outrage from these same conservatives over the law that George Bush signed while he was governor of Texas that allows hospitals to pull the plug on terminally ill patients over the objections of their families all just to save money? This is truly a disgusting display of hypocricy. Republicans are willing to go to extremes to save one patient in a permanent vegatative state, and yet they allow other people to die and/or go without medical care to preserve their precious tax cuts for the rich. Ouch! That’s quite a charge to level at those pathetic liberals. No wonder they are so despised today! But wait! Let’s look at this another way. If it is fair to say that liberals “love” Saddam because they opposed the Iraq war, then it must also be fair to say that President Bush “loves” North Korean dictator Kim Jong Il because he does not currently favor launching a military invasion to oust his corrupt government and free the people of North Korea. And Kim Jong Il actually has WMDs!!! Why does Bush have this fanatical love for Kim Jong Il??? Why does George Bush hate America??? Please help me understand how this can be, Commando. Oh, my! Looks like it’s time for another history lesson. Which U.S. president had a secret policy to give financial support to Saddam Hussein that helped build up his military might? Which U.S. president signed a top secret national security directive ordering closer ties with Saddam Hussein’s government long after he had committed the mass murders of the Kurds in his own country? That’s right. The Republican administrations of Ronald Reagan and George H.W. 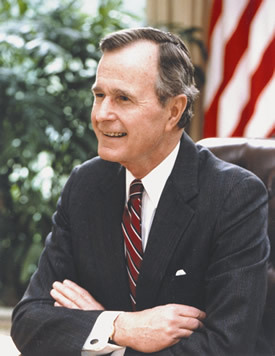 Bush, over the objections of congressional Democrats, helped to build Saddam’s military and supplied him with most of the chemical weapons that he used in his attacks on the Iranians and the Kurds. Why were we so certain that Saddam had WMDs? Because we gave them to him! We just failed to realize or accept that he had gotten rid of them over the years. Here is an excellent chronology detailing U.S. involvement in supporting Saddam’s regime. February, 1982. Despite objections from congress, President Reagan removes Iraq from its list of known terrorist countries. 1982-1988. Defense Intelligence Agency provides detailed information for Iraq on Iranian deployments, tactical planning for battles, plans for air strikes and bomb damage assessments. November, 1983. A National Security Directive states that the U.S would do "whatever was necessary and legal" to prevent Iraq from losing its war with Iran. October, 1983. The Reagan Administration begins secretly allowing Jordan, Saudi Arabia, Kuwait, and Egypt to transfer United States weapons, including Howitzers, Huey helicopters, and bombs to Iraq. These shipments violated the Arms Export Control Act. November 1983. George Schultz, the Secretary of State, is given intelligence reports showing that Iraqi troops are daily using chemical weapons against the Iranians. December 20, 1983. Donald Rumsfeld , then a civilian and now Defense Secretary, meets with Saddam Hussein to assure him of US friendship and materials support. There is lots more history of U.S. support for Iraq here and here. But the point here is to emphasize how outrageous and hypocritical it is for conservatives to now be blaming liberals for Saddam Hussein and his regime. So Saddam might still be in power today if liberals had there way. So what? The time to get rid of Saddam was 20 years ago. By 2003, the threat posed by Hussein had diminished significantly according to the Duelfer report. While Saddam was a threat we were on his side, supporting him with arms and funding. After he had lost most of that capacity due to U.N. sanctions and had been reduced to a delusional old man writing bad novels, we decide to launch a costly military invasion. And now we are supposed to believe that it was all done for humanitarian reasons because this administration loves freedom. Bull! How do you define "Quagmire"? My conservative friend Alamo City Commando observes in the comments to the previous post that "liberals in this country think Iraq is a quagmire while the Iraqis are happy to be free." There were quite a few Vietnamese who were happy when we were controlling Saigon and very unhappy after we left. But that did not make the Vietnam War any less of a quagmire. How do we define quagmire anyway? It would be interesting to know what definition conservatives would have used prior to the war. Back then, the Bush administration was arguing that the conflict would be settled in a matter of months if not weeks. Now, we are past the two-year anniversary with still no end in sight. Back then, the Bush administration was reassuring us that U.S. casualties would be few - possibly along the lines of the first Gulf War, if that many. Now, we have passed the 1,500 mark for U.S. military fatalities and 11,000 wounded, and still with no end in sight. Back then, the Bush administration was telling us the cost of the war would be negligible and would be recouped with Iraqi oil revenues. Larry Lindsey, the president's top economic advisor, was forced to step down for suggesting that the cost could rise to as much as $100 billion. Now, the cost to U.S. taxpayers has exceeded $300 billion with no end in sight. So I'll ask again. How do we define quagmire? Let's recap: We've been there for two years, spent $300 billion and lost 1,500 U.S. troops and the Iraqi government is still so weak that it would collapse like a house of cards if we were to even suggest pulling out in the next six months. If it had been suggested prior to the start of the war that this would have been the cost and the end result - is there any question that the vast majority of U.S. citizens would have joined the rest of the world in condemning this unprecedented pre-emptive invasion to search for non-existent WMDs?